Co. Antrim: Ahoghill, Ballyclug, Ballyconnelly, Ballymena (3), Ballyscullion, Broughshane, Clogh, Cloghogue, Dundermot, Dunmanaway, Dunminning, Galgorm (2), Glenbuck, Glenravill, Glenwhirry, Kells (2), Kirkinriola, Lisnagarran, Longmore, Newtown Cromellin, Portglenone (2), Slemish, Toome. The Board also included 6 ex-officio Guardians, making a total of 34. The Guardians met each week at 1pm on Saturday. The population falling within the Union at the 1831 census had been 66,964 with divisions ranging in size from Dundermote (population 1,069) to Kells (5,708) and Ballymena itself (5,644). The new workhouse, built in 1842-3, was designed by George Wilkinson and occupied a six-acre site at the west side of Cushendall Road to the north of Ballymena. It could accommodate 900 inmates. The cost of the building was £6,600 plus £1,800 for fixtures and fittings etc. It was declared fit for the admission of paupers on 3rd November 1843, and admitted its first inmates two weeks later on the 17th November. The site location and layout are shown on the 1905map below. The buildings followed one of Wilkinson's typical layout of this period. An entrance and administrative block at the east contained a porter's room and waiting room at the centre with the Guardians' board room on the first floor above. Side wings linked the entrance block to the main accommodation block which had the Master's quarters at the centre, and male and female wings to each side. Ballymena main block from the north-east, 2003. Ballymena central spine and rear of main block from the south-west, 2003. During the famine in the mid-1840s, sleeping galleries and additional accommodation were erected. A temporary fever hospital was set up in a house belonging to Sir Shafto Adair until a 40-bed permanent building was erected at the south-west of the workhouse. 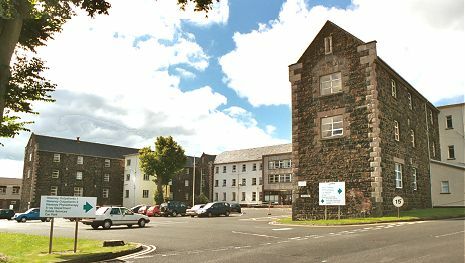 Ballymena fever hospital from the north-east, 2003. At the 1901 census, the population of the Union was 53,082 with 19 officials and 355 inmates in the workhouse. 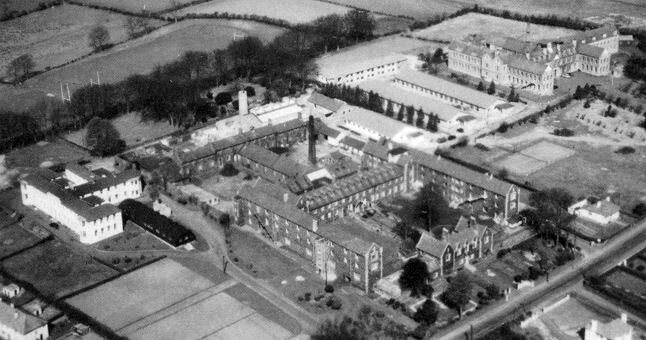 The workhouse later became Braid Valley Hospital. The entrance block has been demolished but the main building and fever hospital survive. Public Record Office of Northern Ireland, 2 Titanic Boulevard, Titanic Quarter, Belfast BT3 9HQ. Holdings include: Guardians' minute books (1848-1936); Workhouse registers (1843-1947); Indoor relief lists (1937-40); Outdoor relief register (1899-1947); Outdoor relief lists (1943-8); etc.